Give a woman power tools, and creative things will happen (whether they were meant to be that way or not). It was cheap. Even in its day it was must have been cheap, its construction is mediocre, its parts are economy. And your eyes do not deceive you, its handle is broken off and irretrievably lost. But that made it unloved, and cheap. First thing is the replacement handle. 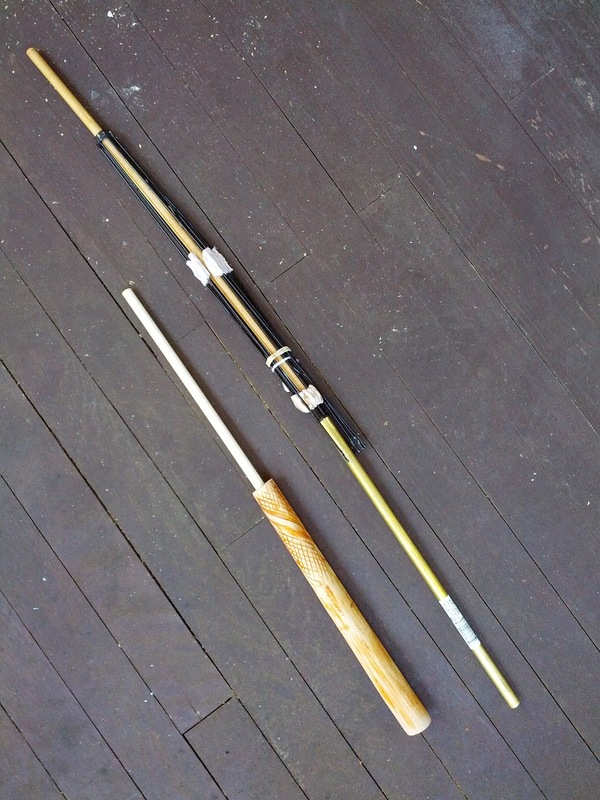 I had originally planned to use an ordinary dowel, but went with the top end of a walking cane instead. A dowel would have had uniform thickness from top to bottom, while canes are generally a bit tapered, and that made, I think, for a more natural shape. The cane I used was *ahem* cheap, not very round, and not even meant to be used as a cane (it's only decorative). 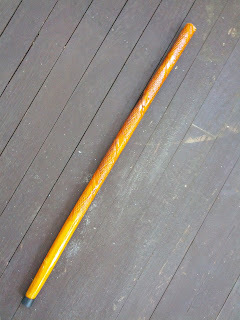 But it was a tapered stick of wood, which would do the job. 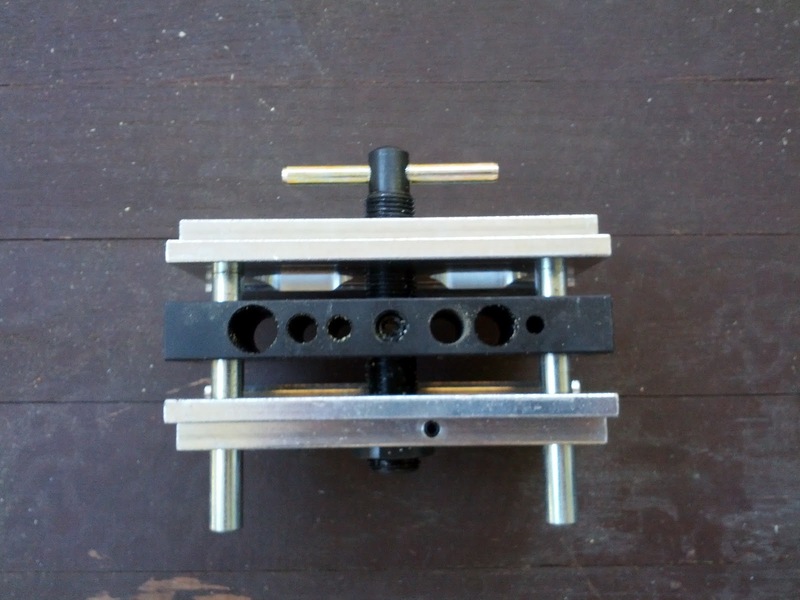 This is a doweling jig, which one uses to drill holes into the ends of planks in order to join them with dowel pins. Lynn has one that she's used to build a table, or something (Lynn is a master at technical solutions). 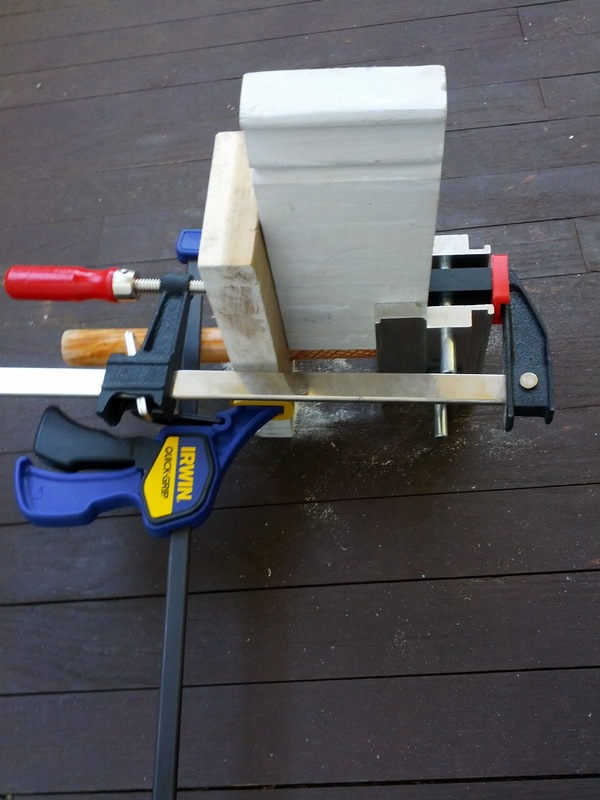 The doweling jig solved half the problem. I still need a way to hold the dowel itself, because if I just clamped it into the jig, the dowel would likely just rotate with the drill bit (or so I read on woodworking websites). 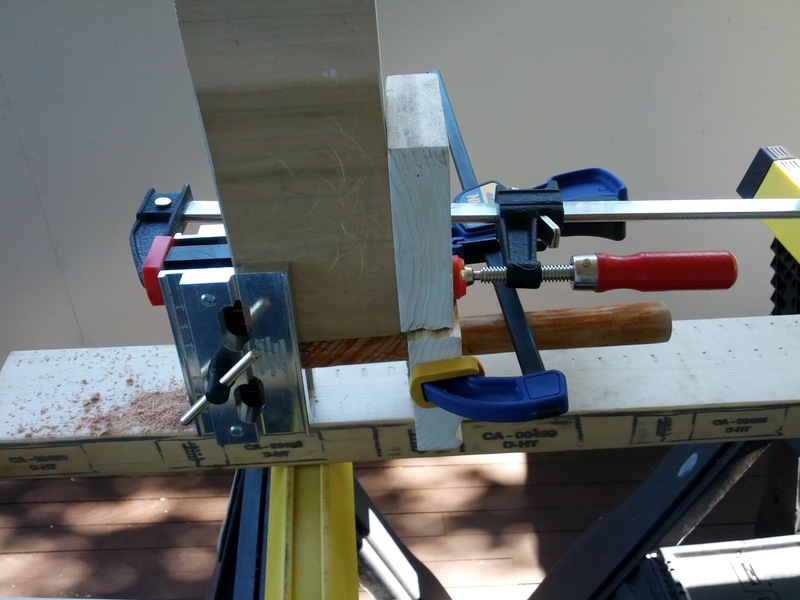 So, I needed a dowel jig...for the doweling jig. Yeah, stay with me here. 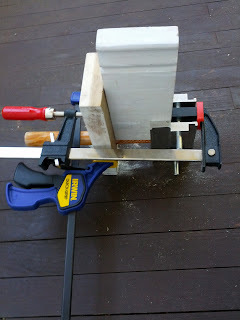 I found the solution here: http://www.woodworkingonline.com/2008/04/08/dowel-drilling-jig/ I just needed to adapt it for the doweling jig. First, to drill a big hole. 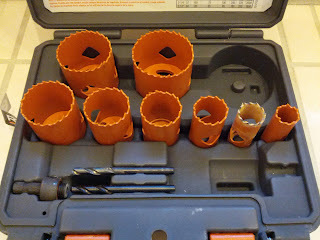 So happens I have these big drilling bits (don't ask why, I do a lot of DYI on my house). Big old bore drilling bits. had planned better, it wouldn't have split. 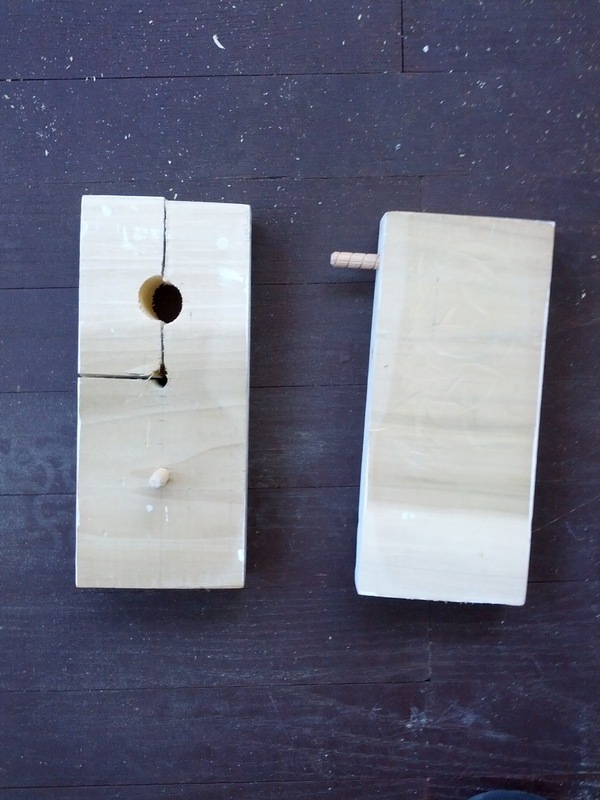 I wanted to fix a second piece of wood at a right angle to the one with the dowel hole, so I drilled holes for two dowel pins into the piece on the right (and used the doweling jig for this, yep, it works every bit as well as advertised!) 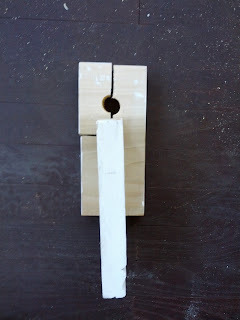 Then I went to drill two holes into the piece on the left, and, well, I tried to drill into the kerf and split the wood. I went at it with a file to see if I could make it work anyway. I got the other dowel pin to fit, but notice here that the upright piece is at an angle. Yeah, that's not helpful when you're trying to line things up perfectly. These are postmortem photos, and I only noticed the off-kilter angle when I took them. I'll have to fix that before I try this again. Now to put it all together. 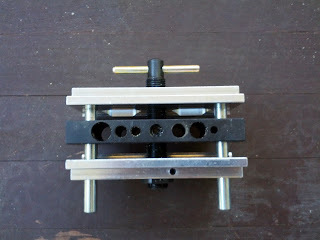 I clamped the work piece, the new handle, into the hole, and clamped the whole thing into the doweling jig. Yes, that made quite a contraption. 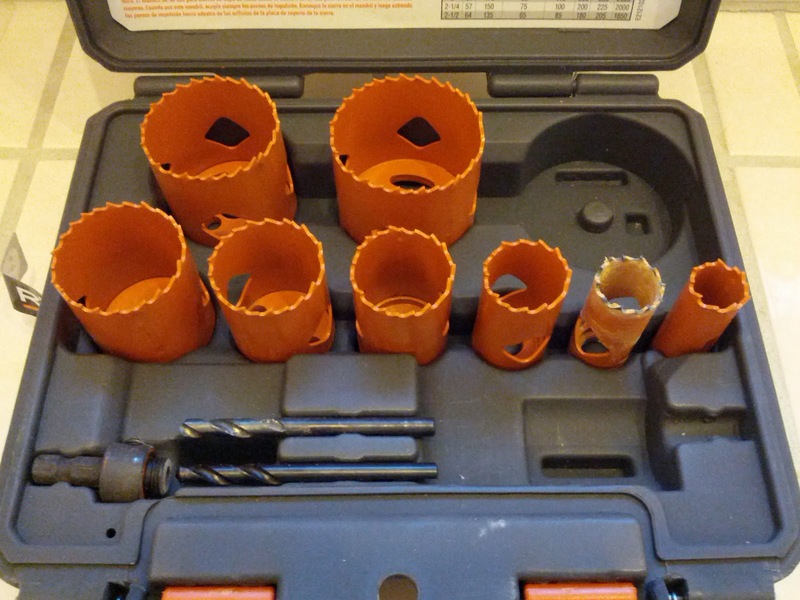 Ready to drill. Here you can see the work piece. And here's what it looks like. Bit off center, but it'll do. 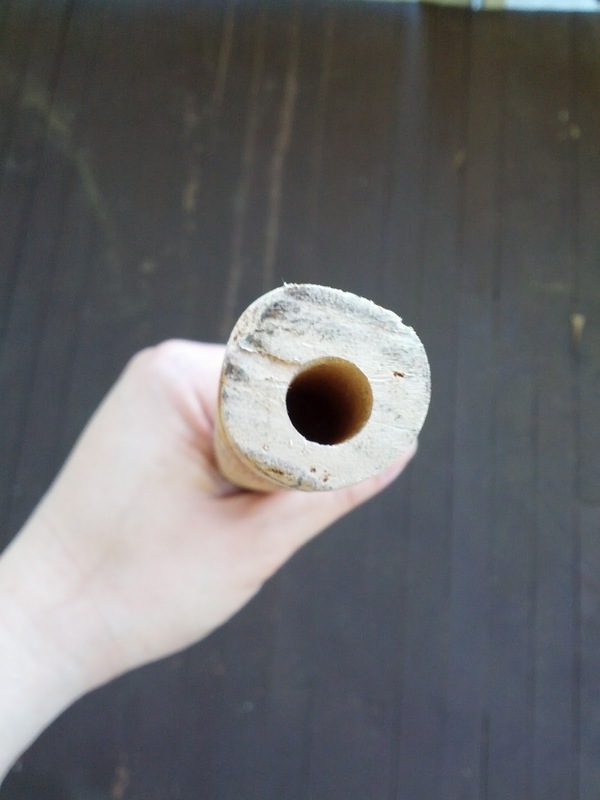 3/8 inch bore hole for the new stick. connect and support the joint. 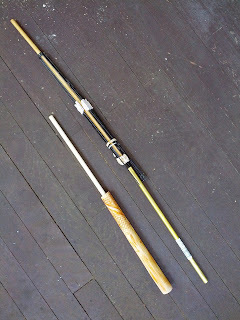 Notice that the frame, with the tube attached, is bent. I don't know what the original frame's stick is made of but it's certainly not a great piece of wood. At this point I need to trim the brass tube, and I want to sand the handle some more. But it was late, I was hot and hungry, and decided to call it an evening. 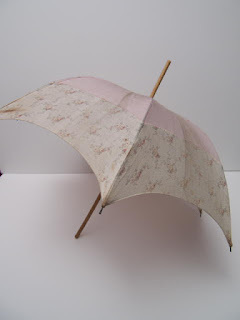 I finished the powder blue cotton parasol that I was embroidering in this earlier post. This parasol was the finished sample for my class last week, though it wasn't really done until I picked up the tassel from Lynn McMasters at the class. Here's the full photo spread I took after the class. to embellish, first with some simple embroidery. In the upper area I put four rows of tucks. A full view of the underside. Lynn is teaching a class on tassel making at Costume College. She and I have been lamenting how modern tassels and fringe just don't look like the silk tassels and fringe of 100 years ago. She's been developing tassels. I've been developing fringe. But more on that later. And propped in a corner. For your amusement, here's the reverse sequence of how this parasol came from a modern umbrella.